Taylor Scott Amarel filed this request with the Mayor's Office of Miami, FL. $49.23 raised out of $49.23. I would like to obtain all emails sent to, from, or copied to Tomás Regalado, Former Mayor from January 1, 2015 to Present day, containing any of the following non-case-sensitive key-strings: 'EB-5', 'Regional Center', 'USCIS', or 'EB5'. Please note that the Office of the City Clerk is in receipt of your email; however, our office is not the custodian of the requested information. The Office of the City Clerk is the records custodian for City Commission legislation, transcripts of Commission meetings, and agreements between the City of Miami and various parties. Therefore, your request is being forwarded to the City’s Public Records Coordinator, Domini Gibbs, who is copied on this email for proper handling and dissemination to the custodian of the requested information. Ms. Gibbs can be reached at (305) 416-1811 or via email at PublicRecords@miamigov.com<mailto:PublicRecords@miamigov.com>. Questions about your request? Reply to this email or sign in to contact staff at Miami. Subject: Your Miami public records request 18-585 has been opened. Your Miami public records request 18-585 has been opened. Your record request #18-585 has been submitted. You can see it anytime at the link below. The City of Miami acknowledges your public records request. The City of Miami will make a reasonable effort to determine whether such records exist and, if so, the location at which the record can be accessed or copied or if any exemptions apply. You will be notified accordingly of the availability of the records and any associated fees. If you have any questions please do not hesitate to contact us. Thank you. Thank you for forwarding the below Public Records Request. We will process it accordingly. Disclaimer: This e-mail is intended only for the individual(s) or entity(s) named within the message. This e-mail might contain legally privileged and confidential information. If you properly received this e-mail as a client or retained expert, please hold it in confidence to protect the attorney-client or work product privileges. Should the intended recipient forward or disclose this message to another person or party, that action could constitute a waiver of the attorney-client privilege. If the reader of this message is not the intended recipient, or the agent responsible to deliver it to the intended recipient, you are hereby notified that any review, dissemination, distribution or copying of this communication is prohibited by the sender and to do so might constitute a violation of the Electronic Communications Privacy Act, 18 U.S.C. section 2510-2521. If this communication was received in error we apologize for the intrusion. Please notify us by reply e-mail and delete the original message. Nothing in this e-mail message shall, in and of itself, create an attorney-client relationship with the sender. Under Florida law, e-mail addresses are public records. If you do not want your e-mail address released in response to a public records request, do not send electronic mail to this entity. Instead, contact this office by phone or in writing. Thank you very much for the response and assistance. I look forward to receiving the documents. Happy Friday! Please review the suggested criteria below for your email query. Please advise if there are any edits you wish to make to the suggested criteria. If the suggested criteria are acceptable, a non-refundable deposit of $42.81 needs to be made to commence running the query. If the query takes an hour or less, no additional fees will be assessed and the records will be produced upon completion of the review for any statutorily exempt emails. If the query takes more than an hour to run, then additional fees may be assessed based on the additional time spent beyond the initial hour to complete your query. A detailed summary will be provided detailing the hourly rate of the employee completing the query and the total time spent completing your query. The additional fee must be paid prior to receiving the requested records. Payment of fees can be made to the "City of Miami" and delivered to the Information Technology Department on the 5th floor of the Miami Riverside at 444 SW 2nd Avenue, Miami, FL 33130. Payment can be done by check or cash. Please be advised that if paying in cash, please bring exact change. The process to create the storage media will take approximately 4 business days after receiving the approval and payment. The costs include searches for Civilian mailboxes. Police mailboxes are not included. If the request is related to a law matter case or may include any other exempted emails, then a review of the results may be required before being released and this may add more delivery time. Please find enclosed a check for $42.81 to satisfy the fee associated with the attached public records request. A check for $42.81 is on its way. I wanted to follow-up on this request, have the documents been released? I do not see an update on the NextRequest portal. Hi, how are you? I hope that all is well. I just followed up with the IT Department again and they have not received your check. Can you please confirm where you sent it to. IT will not initiate the search until the funds are remitted. 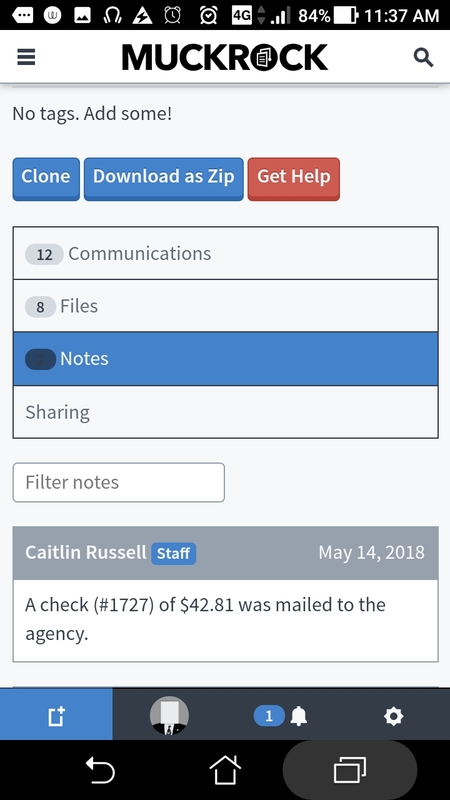 The check was sent through the MuckRock platform (see screenshot attached), I have followed up with them to ask the address it was sent to. Sorry for the trouble. It’s possible they sent it elsewhere, and will have to cancel the check and remit another one. They also need to place the Public Records Number on the check. A check in the amount of $42.81 was mailed to 3500 Pan American Drive, Miami, FL 33133 on May 12 to pay for the fulfillment of PRR 18-585. Was this the correct address, or should it have been sent elsewhere? If it's been received can you please confirm receipt? Thanks! Hi, how are you? I hope that this email finds you well. I am going to contact City Hall and see if they received the check. I will keep you posted. Thank you so much for your note. Please let us know whether you are able to obtain the check; if not, we would be happy to send another. As soon as the IT Department receives the check they will notify me, and I will update you promptly. I wanted to follow up on the following Florida Sunshine Law request, copied below, and originally submitted on April 28, 2018. Please let me know when I can expect to receive a response, or if further clarification is needed. You had assigned it reference number #PRR 18-585. Thank you for your email. As of today, we are still not in receipt of the check for the IT Search. Please remit payment so that we can proceed to run the IT Search. As of today, we are still not in receipt of the check for the IT Search. Please advise if you would still like to proceed with the above referenced Public Records Request or if I may close it accordingly. Thank you for your email. I am working on your above referenced Public Records Request and hope to have the documents to you soon. I will keep you updated. Please feel free to check in with me as well. Please be advised that some responsive documents have been uploaded to Next Request for your review and/or download. Please be advised that all responsive documents have been produced. As such, this Request is going to be closed accordingly. Subject: Your Miami public records request 18-585 has been closed. Your Miami public records request 18-585 has been closed. Record request #18-585 has been closed.